​before becoming a great Australian media celebrity. Photo: The beautiful and mesmerising Pilta performing in Australia soon after becoming shipwrecked off Darwin in 1959. 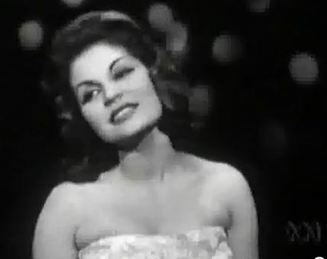 Pilita became a legend of entertainment in Australia becoming the first woman to make the Australian pop charts. If you look closely you will see the Australian Broadcasting Corporation (ABC) media logo in the bottom right hand corner. Pilita is one of the Grand Dames of Victorian, Australian radio and television. Born a Filipino, educated in Spain and arrived in Australia as a stranded boat person after the luxury cruise yacht of American actor and magician John Calvert she was travelling on from Singapore became shipwrecked in 1959 off Darwin. Asia's Queen of Songs, and one of the Great Dames of Victorian, Australian Radio and Television, Pilita Corrales will perform in the Canterbury Leagues Club, Sydney, Sunday 9th October 2016. The Royal Australian Airforce (RAAF) spotted her after a search, and she was rescued by the Royal Australian Navy (RAN). RFA previously did a feature story on Pilita detailing these events and her great career in Australian media which followed. Pilita made her mark on the Australian entertainment scene by becoming the first woman to make the Australian pop charts with a local recording called 'Come Closer to Me'. She became a darling of the Victorian Television in Melbourne. She was billed as one of the Grand Dames of Victorian Radio and Television. Some of Pilita's hit songs in the Philippines include ‘A Million Thanks To You’, ‘Kapantay Ay Langit’, and ‘Ang Pipit’.